The fourth CKCU Ottawa Folk Festival, held from August 22 to 24 at Britannia Park, was a hit. Bruce Cockburn returned to his hometown, much to the delight of the record crowds that gathered for his dynamic performances. Cockburn appeared at a main stage evening concert on the opening night of the festival. The next day he participated in the reunion of the famous sixties Ottawa group, The Children. The festival main stage lineup was particularly strong: Lawrence Gowan, Shari Ulrich, Robert Paquette, The Arrogant Worms, Alpha Yaya Diallo, Melanie Doane, Tamarack, Cindy Church and Rebecca Campbell. Chopper McKinnon and Karen Flanagan McCarthy returned to host the main stage throughout the festival. 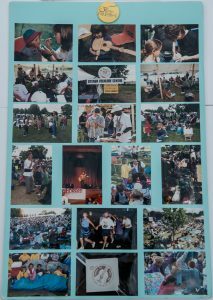 The year 1997 also marked the 20th anniversary of the first folk festival to be held at Britannia Park. TheFestival for the Folks was held there from 1977 to 1979. 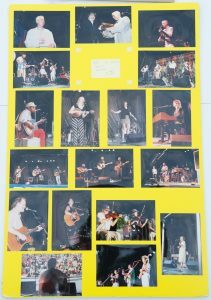 Perhaps the most poignant moment of the 1997 festival was a special ceremony in memory of the late Colleen Peterson, which was attended by some of her closest friends and many fans. Festival Director Gene Swimmer, Artistic Director Chris White and the organizing committee worked harder than ever to put on the 1997 festival. The funding from major sponsor CKCU ended due to the community radiostation’s financial problems. A tremendously successful Benefit Concert Series made the festival possible. The 1996/1997 benefit concert series included the following concerts held at the National Library of Canada. The festival held its first Silent Auction during the intermission of the Arlo Guthrie concerts on Dec. 7 and 8. Thanks to Carol Silcoff and a team of volunteers, and the many generous donations from local artisans and businesses, the event was a huge success. The Regional Municipality of Ottawa-Carleton, the Ontario Arts Council, Nortel, the Ottawa Citizen, Phase 2, Air Nova, CS CO-OP, Hershey, the SOCAN Foundation, the Luxor Hotel and the Glebe Loebalso provided vital support to the festival. There was a sense of eager anticipation in the air when the festival opened on Friday night, as the audience awaited the appearance of Bruce Cockburn. Arthur McGregor, longtime sponsor and owner of the Ottawa Folklore Centre played a wonderful acoustic guitar version of our national anthem to open the festival. Performers including the female group Travelling with Jane, popular Robert Paquette, the zany Arrogant Worms, the fiery African-inspired Alpha Yaya Diallo, and another Ottawa native, singer Rebecca Campbell.Cockburn’s polished and dynamic set was greeted with enormous enthusiasm by an appreciative hometowncrowd. Although an international star in his own right, Cockburn made it clear he was enjoying a return to his roots. Cockburn was presented with the keys to the City of Ottawa, as well as the Helen Verger Award for his valuable contributions to Canadian folk music. The daytime entertainment on Saturday featured a potpourri of styles and subjects. Quite a buzz was generated by The Children and Le Hibou workshop hosted by Richard Patterson. The musical group of hopefuls that first banded together in 1965 included many who would make considerable contributions to the Canadian cultural scene: Bruce Cockburn, David Wiffen, Richard Patterson, Sandy Crawley, Sneezy Waters, Neville Wellsand Chris Anderson. The Children often appeared at legendary folk venue Le Hibou. Sessions focusing on the themes of passion and the lives of girls and women took place on the Green Stage.Guitars are Us was the amusing title for a session that showcased the many styles of this versatile instrument that is so prevalent in folk and roots music. Participatory sessions abounded. The Ottawa Folklore Centre hosted a series of sessions encouraging people to sing along, or to play the slide guitar or harmonica. Debbie McWatty Reid hosted a session on how tostepdance, while Kate McKay encouraged everyone to dance, dance, dance. A country dance was presented by Lonesome Paul and the Valley Ramblers with Jody Benjamin. An enthusiastic group took part in theOttawa Folklore Centre Weekend Choir Practice, hosted by Andy Rush. The Ottawa Citizen Family Area was just the place to see juggling, magic shows, “kidsongs”with Tom Plantand stories with Dean Verger. Kids also ventured to the Inside Stage for a Valdy for Kids session. The Nortel Stage featured a session highlighting the rhythms of Africa and a live version of the CKCU traditional country, western and bluegrass music show The Back 40; Alex Sinclair hosted an Acoustic Wavessession featuring performers who had appeared in the longstanding folk/roots concert series. The Red Stageshowcased double bills by Robert Paquette and Lizanne Evely; and Shari Ulrich and Melisse Lafrance; whileCindy Church appeared solo. The Green Stage offered double bills with Bill Bourne and Bill Huggins; Joe Hall and Barb Matticacci, as well as Alpha Yaya Diallo in concert. At the Point Stage you could go around the world in 30 minutes with George Sapounidis! The evening main stage performances opened with Guy Davis, an acoustic blues revivalist. Singer-songwriter and instrumentalist Melanie Doane was followed by a band she once belonged to: Tamarack of Guelph, Ont. The group is well known for its traditional arrangements that tell tales of the history of Canada. Meryn Cadellprovided her own unique spin on contemporary life through music and the spoken word. The Montreal-based band Zekuhl had the crowd hopping with an eclectic set of African and Latin rhythms. Some skeptics doubted that Lawrence Gowan could make the transition from arena rocker to folk festival headliner. Gowan proved that he could, and delivered his piano-based music with panache and style to spare. The former rock star illustrated that good music begins and ends with the story and song. Sunday was another gorgeous day at the festival. The afternoon exemplified Gary Cristall’s idea of a good festival lineup: “a program with so much music you want to see, you do not know where to go”. 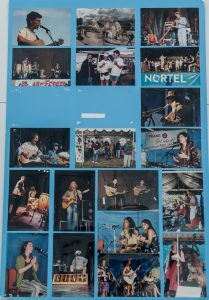 The Nortel Stage featured a live broadcast of the CKCU Celtic music program, Music From the Glen; stories and songs with Dean Verger; and Meryn Cadell in concert. 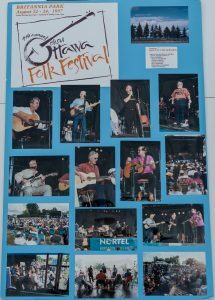 Fiddle Fever featured fiddlers aplenty, while the session It Was 20 Years Ago Today showcased Ian Tamblyn, Shari Ulrich, David Wiffen and others who had appeared at the Festival for the Folks at Britannia Park two decades earlier! The Inside Stage was the location of a lively square dance with Paddies on the Tundra; and double bills featuring Pamela Morgan and the Last Chance Saloon competition winners the Mudpouts; and Lawrence Gowan and Meg Lunney. Kids were delighted with concerts designed with them in mind presented by James Gordon and Del Fuego. Those who camped out in front of the Red Stage were treated to double bills withLinda Morrison and Jennifer Noxon; Gaston Bernard and Kagiso Mpala; and a bluesy triple bill with Paul Fenton, Vince Halfhide and Guy Davis. Fans of the spoken word were entertained by members of SugarBeat, along with Alex Mortimer, Justin Haynes, Sandra Nicholls and Kagiso Mpala. On the Green Stage, CBC Radio recorded a live-to-tape broadcast of the acoustic/roots music show Heartland Live, hosted by Bill Stunt. The Green Stage also showcased the talents of the worldbeat acoustic band Raintree; Generation F performersShoshona Kish, Lizanne Evely, Raven Kanatakta and Rob Commins; Melanie Doane and the Toasted Westerns. The session Play Me a Rock & Roll Song featured Valdy, Lawrence Gowan and Lizanne Everly. At the Point Stage, way down by the water, you could take in performances by wind instrumentalist Robbie Anderman, or sample the acoustic blues of Larry “The Bird” Mootham, Vince Halfhide, Linda Morrison,Paul Fenton and Guy Davis. The Family Area showcased awesome feats by Tawney Ross; “kidsongs” withLinda Morrison and Russell Levia; and stories with Dean Verger. Doctor Magic provided what you would expect, and Del Fuego appeared unplugged. The Ottawa Folklore Centre Weekend Choir kicked off the evening main stage performances. A flurry of fiddling next ensued with renowned instrumentalists Calvin Vollrath, Trent Brunner and April Verch. The dynamic Shari Ulrich performed next, followed by the bluegrass stylings of Steel Rail. Ottawa favourite Ian Tamblyn appeared with his usual assortment of musical gems. The evening ended with a heartfelt performance by Newfoundlander Pamela Morgan and perennial festival performer Valdy.